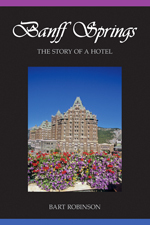 Description: Banff history books cover many subjects, but Banff Springs: The Story of the Hotel is the only book in print that tells the story of the Banff Springs Hotel, one of the world's great mountain resorts. Some institutions transcend themselves and become symbols of a place and time. Known to millions of visitors to Banff as "the Castle," or simply as "the Hotel," the Banff Springs is more than simply a place to stay, for it is the home of memories and a dream of gracious times in other ages.